Duck is the common name for a number of species in the Anatidae family of birds. Ducks are divided between several subfamilies. Ducks are mostly aquatic birds, mostly smaller than their relatives the swans and geese, and may be found in both fresh water and sea water. Swimming gracefully across a pond or waddling comically across the land, ducks are a common feature of the landscape of most of America. Ducks are very social animals. Males (drakes) and females sometimes live in pairs or together with their ducklings. They communicate both vocally and with body language. At other times ducks spend much of their time—during both day and night—in larger groups. The domestic duck has a normal life span of ten years. Most ducks have a wide flat beak adapted for dredging. They exploit a variety of food sources such as grasses, grains and aquatic plants, fish, and insects. Some (the diving ducks) forage deep underwater; the others (the dabbling ducks) feed from the surface of water or on land. To be able to submerge easier, the diving ducks are heavier for size than dabbling ducks, and therefore have more difficulty taking off to fly. A few specialized species (the goosander and the mergansers) are adapted to catch large fish. In a wildlife pond, the bottom over most of the area should be too deep for dabbling wild ducks to reach the bottom, to protect bottom living life from being constantly disturbed and eaten by ducks dredging. The sound made by some female ducks is called a "quack"; a common (and false) urban legend is that quacks do not produce an echo. The males of northern species often have showy plumage, but this is molted in summer to give a more female like appearance, the "eclipse" plumage. Many species of ducks are temporarily flightless while molting; they seek out protected habitat with good food supplies during this period. This molt typically precedes migration. Some duck species, mainly those breeding in the temperate and arctic Northern Hemisphere, are migratory, but others are not. Some, particularly in Australia where rainfall is patchy and erratic, are nomadic, seeking out the temporary lakes and pools that form after localized heavy rain. In many areas, wild ducks of various species (including ducks farmed and released into the wild) are hunted for food or sport, by shooting, or formerly by decoys. 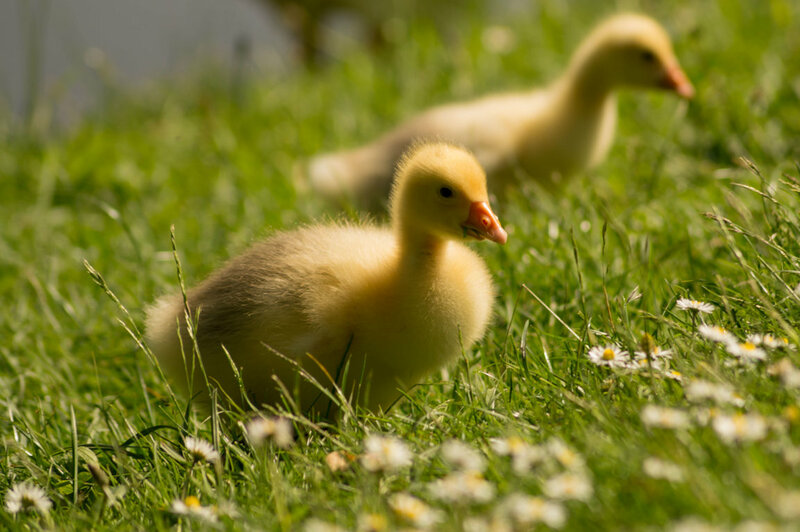 Ducks and geese are wild animals, but they have domesticated counterparts who are raised for their eggs and meat, down and feathers. They're less commonly known as farm animals, yet they can certainly fall within this category.